In the closing minutes of the Season One finale of The Walking Dead, as desperate survivors of the zombie plague realise the hi-tech Centre for Disease Control has failed to find a way to contain or cure the virus, CDC chief Dr Edwin Jenner whispers something in the ear of sheriff’s deputy Rick Grimes. For a series full of incident, tension and – of course – gory violence, it was an intriguingly muted cliffhanger. Had Grimes (Andrew Lincoln) been given vital information with which to keep himself and his companions alive? Or was he told to face facts and that all hope was, indeed, lost? Where to next for Grimes and co, as they make their escape from an Atlanta overrun by flesh-eating “walkers”? Don’t expect any quick answers when the second season begins on the FX channel this Friday (21 October), because it ain’t that kind of show. 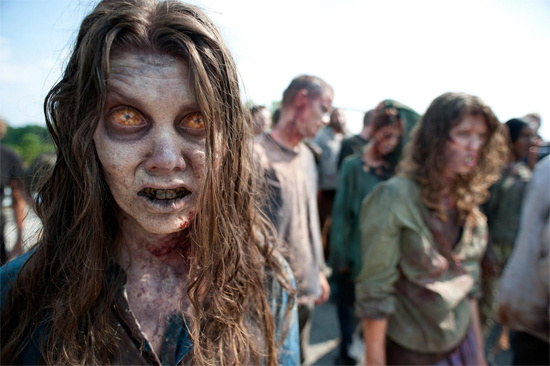 The Walking Dead reveals itself at its own leisurely pace, rightly taking pride in being thinking persons’ science fiction, where the shocks, scares and thrills share equal billing with cerebral sub-plots, fully-formed believable characters and a liberal serving of moral dilemma. For every brilliantly staged march of zombies hunting fresh meat (and there’s a real humdinger in the season opener, set on a freeway littered with abandoned cars), there’s a perfectly pitched human story, as Rick, his stoic wife Lori (Sarah Wayne Callies), fellow lawman Shane (Jon Berthnal), suicidal Andrea (Laurie Holden) and wise old timer Dale (Jeffrey DeMunn) face up to the horrors overwhelming theirs and everyone else’s worlds. It’s powerful, tangible drama, deftly elevated way above the good-guys-on-the-run fodder of most sci-fi by awards-worthy performances of great depth and subtlety. The third installment in Season Two is especially tense, expertly threading together three storylines in which the protagonists are faced with harrowing choices, but without reams of cornball dialogue spoon-feeding viewers the plot. On occasion, dialogue isn’t even necessary; the look on the face of T-Dog (Irone Singleton) when he comes across an empty, blood-spattered toddler’s car seat conveys more than words ever could. New faces enter the fray when Rick’s people chance upon another group of survivors holed up in a farmhouse, their introduction providing a genuinely unexpected jolt at the end of the season opener. Led by avuncular medical man Herschel, played by Scott Wilson (shady casino owner Sam Braun in the original CSI), they initially – and perhaps unsurprisingly - arouse suspicion among the more familiar characters. In a post-apocalyptic kill-or-be-killed landscape, can anyone really be trusted? The quality of the first few episodes of Season Two, not to mention the ratings success of the series opener in the US (a million more viewers than any Season One episode) will go some way to allay fans’ fears that the show would suffer after news broke in the summer that show runner Frank Darabont had quit, or been fired, depending on which blog you believe. Darabont, the Oscar-nominated director of The Shawshank Redemption and The Green Mile who spent five years overseeing the transition of The Walking Dead from cult comic book to appointment TV show, was reported to have either a) had difficulty adjusting to the relentless deadline demands of episodic television, or b) clashed with parent production company AMC over finances, forcefully lobbying to maintain a feature film 'look' to set it apart from common-or-garden small Screen sci-fi. He does, however, retain an executive producer credit. If the series has indeed had its bottom line pared to the bone, it doesn’t show. The multi-zombie showdowns of the first few episodes certainly don’t look cheaply staged, and the producers have done well to attract additional on-screen talent of the calibre of Wilson and ever-reliable character actor Pruitt Taylor Vince. After the first season's stingy six episodes, it's encouraging that FX have ordered a faith-keeping 13 instalments for the second run. It's still likely to prove to be not enough for the show’s increasing number of followers. Like the zombies who kick-started the whole thing, we’ll all be left hungry for more. Season Two of The Walking Dead starts on the FX channel on Friday, 21 October, with repeat screenings on Monday (24) and Tuesday (25).